KUCHING: Public Works Department (JKR) Sarawak has been granted RM11 billion of state fund to upgrade the existing 896km coastal roads. Deputy Chief Minister Tan Sri Datuk Amar Dr James Masing said this would include pavement upgrading and improvement works, construction of 232km of Second Trunk Road over a span of eight years, and the construction of nine new bridges along the coastal road network. “The nine new bridges are the 1.208km Batang Rajang, Batang Saribas (1.550km), Batang Paloh (1.7km), Muara Lassa (2.43km), Bintulu Jepak (1.212km), Batang Lupar (5.1km), Batang Rambungan (560m), Sg Krian (690m) and Batang Igan (1.8km). “The exact scope of construction and the upgrading/improvement/rehabilitation works for each of the packages for these projects shall be identified via the technical workshop,” he said at the closing of a seminar on Road Technology and Technical Manpower in Sarawak 2019, by Chief Minister Datuk Patinggi Abang Johari Tun Openg here yesterday. Assistant Minister of Coastal Road Datuk Julaihi Narawi and Assistant Minister of Transportation Datuk Dr Jerip Susil were also present. Masing, who is also Minister of Infrastructure Development and Transportation, said the coastal road network and the second trunk road would provide Sarawak’s coastal areas with better access as it offers seamless connectivity between towns like Kota Samarahan, Sadong Jaya, Sebuyau, Kabong, Tanjung Manis, Daro, Matu, Balingian and Bintulu to the Pan Borneo Highway. 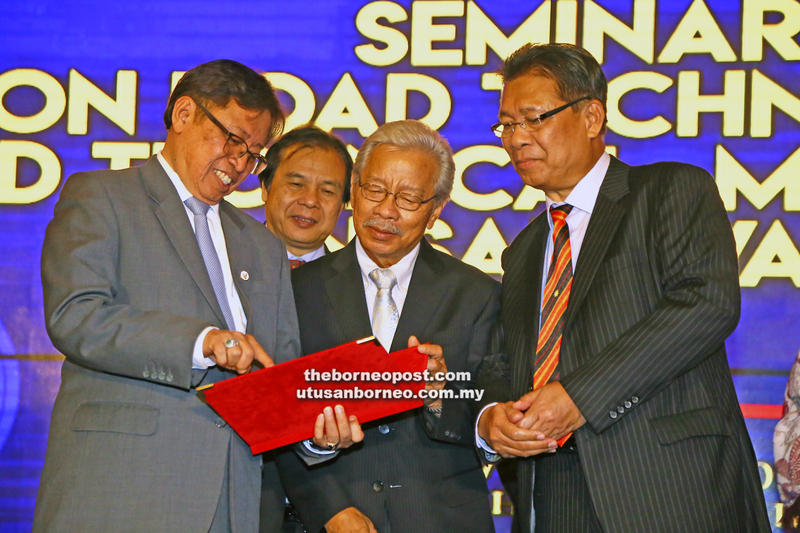 On the second trunk road, Masing said it would link Kuching-Sibu with the Pan Borneo Highway through Sebuyau-Sri Aman-Betong for better connectivity. “Through the second trunk road project, we are looking to shorten the travel distance from Kuching to Sibu, hence reduction in travel time; improved efficiency and safety; opening new areas for development; and to capitalise on Pan Borneo Highway and coastal road network in order to increase mobility in Sarawak,” he said. During the function, Masing presented Abang Johari with resolutions from the outcome of the two-day seminar, one of which proposed for JKR Research Centre to be given more grants to carry out researches on matters such as soil technology.